(Phys.org)—An international team of researchers has found possible evidence of life ten kilometers below the sea floor in the Mariana Trench. In their paper published in Proceedings of the National Academy of Sciences, the team describes samples of serpentine they collected from hydrothermal vents and the material they found in it that offers evidence of life living farther below the surface than was thought. The Mariana Trench is the deepest part of any of the world's oceans. Its lowest point is 10,994 meters below sea level. It is located southwest of Japan, and has been an area of scrutiny ever since the development of underwater pilotless craft called Remotely Operated Vehicles (ROVs). Prior research has shown that the trench formed due to the Pacific tectonic plate sliding beneath the Philippines plate, making it a subduction zone. 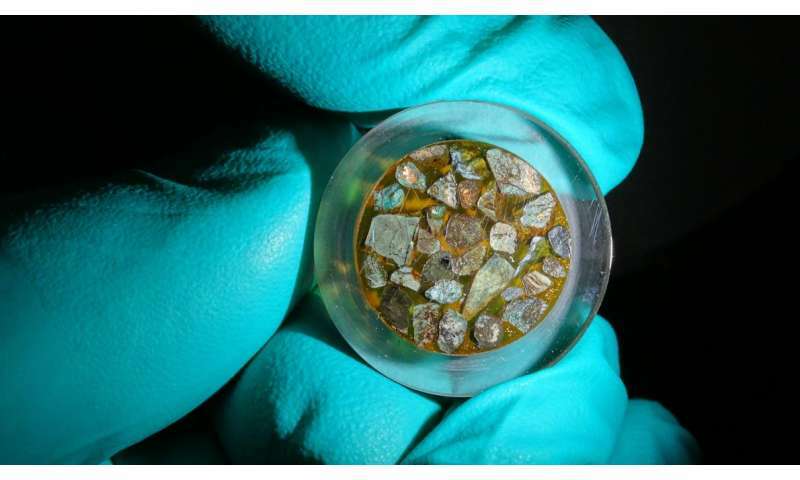 In this new effort, the researchers used an ROV to extract 46 samples of serpentine from the ocean floor near the South Chamorro mud volcano, which they brought back to their lab for study. Serpentine is a mineral that forms when olivine in the upper mantle meets water pushed up from a subduction zone. Such reactions produce methane gas and hydrogen, which the researchers note could be used as a food source by microbes. Serpentine is pushed to the surface of the sea floor by hydrothermal vents, where the researchers found it. Upon examination of their serpentine samples, the researchers found trace amounts of organic material that was very similar to that produced by microbes living in more accessible places. That suggests, the team notes, it is possible that the serpentine samples are evidence of life living far below the surface. The team used data from prior studies to calculate how far below the sea floor the serpentine was formed, which allowed them estimate just how far down the possible microbes might live—approximately ten kilometers below the sea floor. The team acknowledges that their findings are not proof of life below the sea floor; other processes have been known to produce both serpentine and the organic matter, but, they note, it does suggest it is possible. Serpentinization-fueled systems in the cool, hydrated forearc mantle of subduction zones may provide an environment that supports deep chemolithoautotrophic life. Here, we examine serpentinite clasts expelled from mud volcanoes above the Izu–Bonin–Mariana subduction zone forearc (Pacific Ocean) that contain complex organic matter and nanosized Ni–Fe alloys. Using time-of-flight secondary ion mass spectrometry and Raman spectroscopy, we determined that the organic matter consists of a mixture of aliphatic and aromatic compounds and functional groups such as amides. Although an abiotic or subduction slab-derived fluid origin cannot be excluded, the similarities between the molecular signatures identified in the clasts and those of bacteria-derived biopolymers from other serpentinizing systems hint at the possibility of deep microbial life within the forearc. To test this hypothesis, we coupled the currently known temperature limit for life, 122 °C, with a heat conduction model that predicts a potential depth limit for life within the forearc at ∼10,000 m below the seafloor. This is deeper than the 122 °C isotherm in known oceanic serpentinizing regions and an order of magnitude deeper than the downhole temperature at the serpentinized Atlantis Massif oceanic core complex, Mid-Atlantic Ridge. We suggest that the organic-rich serpentinites may be indicators for microbial life deep within or below the mud volcano. Thus, the hydrated forearc mantle may represent one of Earth's largest hidden microbial ecosystems. These types of protected ecosystems may have allowed the deep biosphere to thrive, despite violent phases during Earth's history such as the late heavy bombardment and global mass extinctions. I find it hard to believe we are on the only planet infected with life. "An international team of researchers has found possible evidence of life ten kilometers below the sea floor in the Mariana Trench." "Upon examination of their serpentine samples, the researchers found trace amounts of organic material that was very similar to that produced by microbes living in more accessible places." This data makes perfect sense if interpreted in the light of a recent catastrophic global flood. I know that naturalist scientists insist that the flood never happened (although they were not there to confirm it never happened and more than 500 ancient cultures say it happened). But the fact is that the evidence found here and now makes perfect sense it the a global flood really happened. How would a global flood explain this data? The article explains that these measurements are taken at the bottom of the deepest part of the ocean. Adding a little extra water on top isn't going to explain this observation. There is no known evidence that life exists elsewhere in the universe. No. It doesn't at all. It makes perfect sense that microbes anywhere and anytime produce generally the same organic compounds. I know that naturalist scientists insist that the flood never happened (although... more than 500 ancient cultures say it happened). At the end of the last ice age there were massive floods in many parts of the world, not just from the volume of melt-water, but also from ice blocking rivers. And that is in addition to the sea level rising over 100 meters. I thus do not find it at all surprising that many ancient cultures have flood stories. More evidence supporting Gold's theory of abiotic oil. The planet's crust is alive with microorganisms that manufacture methane. The methane migrates toward the surface, where some is trapped in rock structures like salt domes and shale deposits. The planet "sweats" the bulk of these gasses; in some places, the "sweat" is heavy enough to be detected, such as the Four Corners region. More evidence supporting Gold's theory of abiotic oil. The planet's crust is alive with microorganisms that manufacture methane. But if one looks just at the energy source, it is geological rather than photosynthetic, so it would fit with many parts of the theory.